It’s a summer special that’s hard to resist! 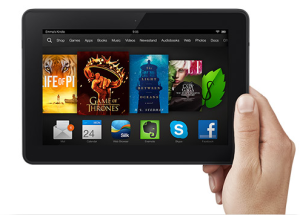 Amazon’s offering big discounts on their Kindle Fire tablets — including their newest high-definition Kindle Fire HDX. It’s now possible to save up to $50 on a new Kindle Fire tablet. And Amazon’s also offering discounts on accessories for your Kindle. But of course, Amazon released an even better tablet last year called the Kindle Fire HDX — and they’re also on sale! Right now you can get a Kindle Fire HDX for just $199. That’s a $30 savings — and Amazon will give you the same discount if you purchase a tablet with extra storage space. The cheapest model comes with 16 gigabytes of storage, but for an extra $40 you can upgrade that to the 32-gigabyte version. And even the 64-gigabyte Kindle Fire HDX now costs just $259 — a $50 discount over its usual retail price of $309! Amazon’s touting the special as a “Back to School” deal (calling their tablets “the perfect gift for students.”) But there’s also some other gift opportunities. If you look carefully at each Kindle’s page, you’ll notice that Amazon’s offering discounted accessories as the right side of the page. 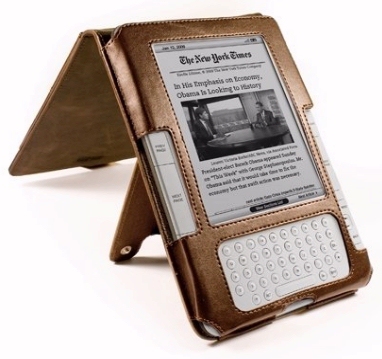 You can save up to $15 on a spiffy new case for your Kindle tablet. (My last Kindle had a leather case, and while reading it was really nice to feel that soft leather-y touch.) The joke’s on Amazon, because this September I have absolutely no plans of going back to school whatsoever. But I’m definitely going to take advantage of this sale!